Italo Calvino was born on October 15, 1923 in Santiago de Las Vegas, Cuba. His father Mario was a tropical agronomist and although originally from Sanremo, he spent 20 years in Mexico before moving to Cuba for work, where he directed an experimental station for agriculture and an agricultural school. His mother, Evelina Mameli, hailed from Sassari and was a botanist and professor at Pavia University. In 1929, the family decided to move definitively to Italy and Calvino attended a Waldensian Christian school and participated in Mussolini’s youth scout program. In 1934, he passed his high school exams and completed the first chapter of his scholastic journey. Calvino’s love for literature blossomed when he was 12 years old, when he grasped a hold of Rudyard Kipling's The Jungle Book. It sparked an infatuation with exotic places, adventures and fantasy which leapt from the pages before him. He also adored reading humorous magazines, and this inspired him to create his own cartoons and comics. In the meantime, the war broke out and it was an event which marked the end of his childhood. Between the ages of 16 and 20, Calvino penned a number of short stories, operas and poems inspired by his favourite poet, Eugenio Montale. But it was through his friendship with his high school classmate, Eugenio Scalfari, that Calvino’s interest for more political themes, in particular, anti-fascism, began to develop. In 1941, having graduated from high school, Calvino enrolled at the University of Turin, choosing the Agriculture Faculty. Following the death of a young soldier, Calvino asked one of his friends to introduce him to the Italian Communist Party (PCI); then, together with his brother, he enlisted in the party and fought for 20 months in one of the bitterest battles between partisans and Nazi-fascists. In 1946, once the war had come to an end, Calvino begun to gravitate towards the publishing house Einaudi and two colleagues, Giansiro Ferrata and Cesare Pavese, convinced him to try to draft a novel. Little did he know, this draft would become his first published book: Il sentiero dei nidi di ragno, an account of the war and the world of partisans. Becoming increasingly involved in the publishing house, Calvino worked in the printing office and advertising and continued to strengthen ties with great names of that era, including Pavese, Venturi, Vittorini, Natalia Ginzburg, Norberto Bobbio and Felice Balbo. However, in 1948, Calvino left Einaudi to work as a journalist for the official Communist daily, L'Unità and the Communist weekly Rinascita. In 1949, he returned to Einaudi and his collection of war stories entitled Ultimo viene il corvo was released. In 1951, he finished writing the novel I giovani del Po, and that summer he spontaneously wrote Il visconte dimezzato. In 1955, Einaudi promoted Calvino as director, a title he maintained until June 1961; after that, he became editorial consultant. The same year, his first series of essays entitled Il modello del leone was released, designed to define his own idea of literature as opposed to the principal cultural trends of that time. The following year, Le fiabe italiane were released with great success, and Calvino made a political turnaround. He was disillusioned by the Soviet invasion of Hungary and the writer decided to leave the PCI. Calvino’s creativity was fruitful and unstoppable; in the subsequent years he went on to write Il barone rampante, Il cavaliere inesistente, and Marcovaldo. 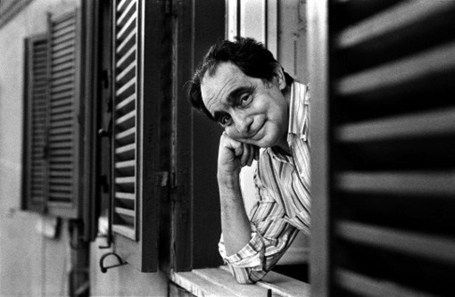 In 1964, Calvino’s private life was flipped upside down; he married an Argentinean woman and moved to Paris, continuing to work for Einaudi. The following year, his first daughter Giovanna was born and with her birth came a sense of personal reinvigoration and energy. Meanwhile, the volume Le Cosmicomiche was released, followed by Ti con zero in 1967, which revealed his childhood passion for astronomy and cosmology. At the same time, Calvino developed a strong interest in semiotics and the deconstruction of texts, so much so that he adopted myriad intellectual methods in the making of his novels, including the “game of mirrors” in Se una notte d’inverno un viaggiatore. The 1970s were rich with journalistic collaborations, new works and awards...many awards. Meanwhile, his villa was completed in Castiglione della Pescaia, where Calvino spent all of his summers. In 1974, he began to write stories, travel reviews and social and political articles for Il Corriere della Sera. In 1985, Calvino prepared a series of texts on literature for the Charles Eliot Norton Lectures to be delivered at Harvard University in the autumn. On September 6, he was admitted to the Santa Maria della Scala Hospital in Siena, where he died during the night between September 18 and 19 of a cerebral haemorrhage. His lecture notes were published posthumously in Italian in 1988 and in English as Six Memos for the Next Millennium in 1993.